What is portable operating? Why would I want to operate outside of my home shack? What would I need to get started? Our next meeting scheduled for April 9 at 6pm will include this discussion and more. Make plans now to join us for this conversation! 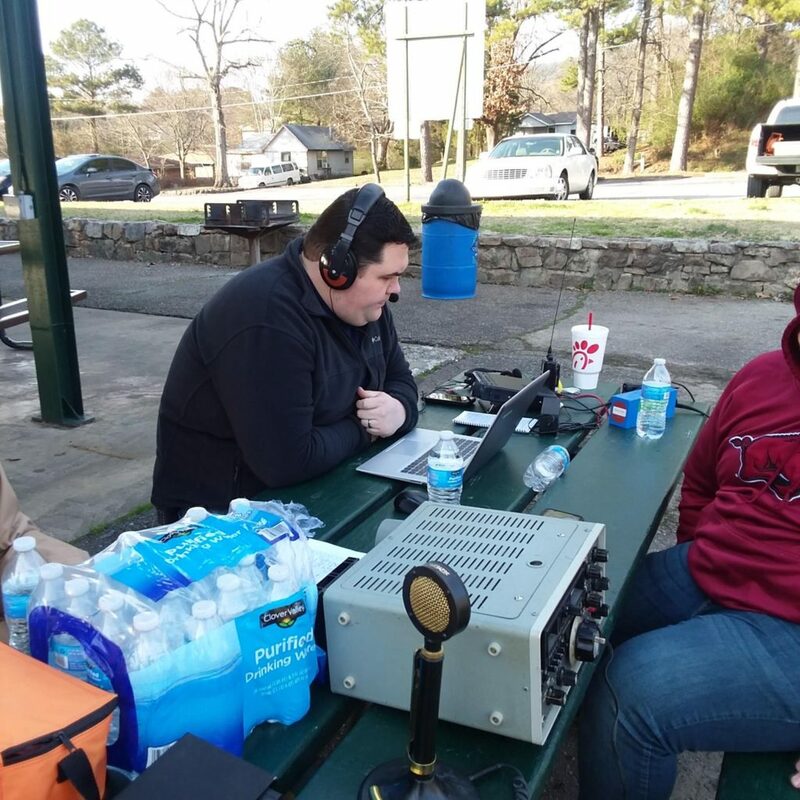 W5LVB (146.880) is located on West Mountain in Hot Springs. This repeater has wide VHF coverage over Garland County. This machine is in place to serve weather events that may require activation of a SkyWarn net, but is also available to local amateurs when not in emergency use. This machine is linked full-time to KA5WPC (146.715) near Mt. Ida. W5LVB (444.600) is located on West Mountain in Hot Springs. This repeater has wide UHF coverage over Garland County. This machine is in place to serve as a backup to the 146.880 machine, but is also available to local amateurs when not in emergency use. WB5SPA (147.180) and WB5SPA (442.350) are located atop St. Vincent Hospital in Hot Springs. These repeaters belong to SARA and are available for use by local amateurs. 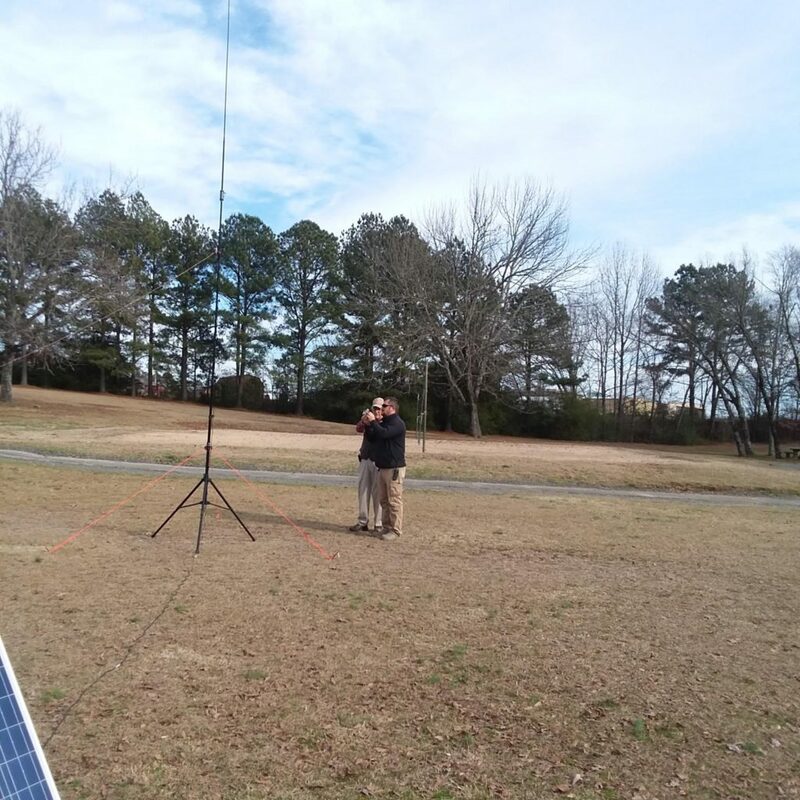 These repeaters have a smaller usable footprint than the West Mountain units due to antenna height and placement, but have good coverage around Hot Springs and near-located areas. KA5WPC (146.715) is located near Mt. Ida on High Peak Mountain. This repeater has wide VHF coverage over Montgomery County and beyond. This machine is in place to serve weather events that may require activation of a SkyWarn net, but is also available to local amateurs when not in emergency use. This machine is linked full-time to W5LVB (146.880) in Hot Springs. KA5WPC (444.475) is located near Mt. Ida on High Peak Mountain. This repeater has wide UHF coverage over Montgomery County. This machine is in place to serve as a backup to the 146.715 machine, but is also available to local amateurs when not in emergency use. KA5WPC (52.910) is a 6m repeater located near Mt. Ida on High Peak Mountain. 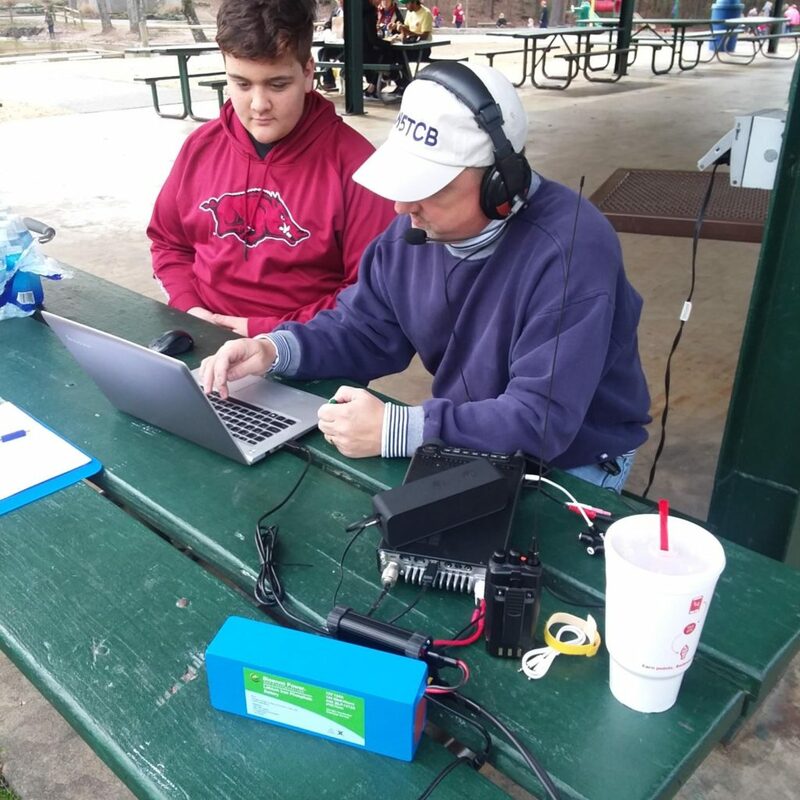 This repeater offers regional coverage over SW Arkansas. This machine is in place to serve as a backup to the 146.715 machine, and is also available for use by local amateurs. Thanks to the owners and trustees of these local repeaters and to Wayne (WA5LUY) for his continued efforts in maintaining all of this equipment! 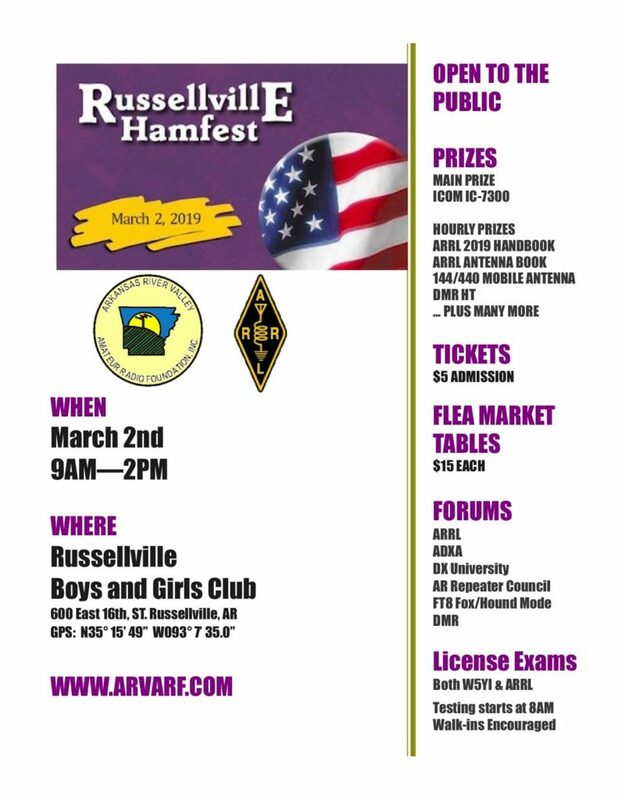 Additional local repeater information can be found here. SARA held its 2nd meeting of 2019 on February 12. Pat (W5VY) gave an excellent presentation on using meteor scatter for ham radio communications. Basically, meteor- scatter work is performed by bouncing radio signals off the ionized trails produced by meteors burning through the ionosphere. Getting started in meteor scatter does not necessarily mean spending a large sum on extra equipment. In fact, you can use a homemade antenna similar to the one presented by Wayne at the January club meeting. If you want to find out more, this is a good place to start. 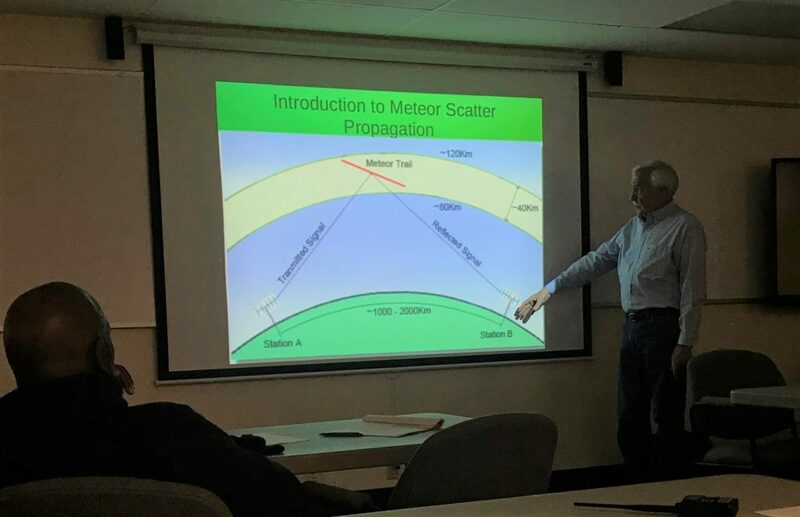 Pat (W5VY) discusses meteor scatter propagation. SARA’s winter field day gathering was held at the Family Park with a good showing of attendees and participants. Those in attendance included Stephen (KG5VXF), Drew (KG5UFU), Scott (K5UYN), Alex (KG5PLY), Daniel (KI5BGM), Frank (N5WEM), Dale (W4NBF), and Chris (W5TCB). The club operated as One Oscar (one transmitter, working outside) for approximately 3 hours making a total of 101 contacts. Bonus points were garnered for working outside, away from home, using no commercial power for transmitting. Thanks to operators Daniel, Drew, and Chris for their efforts.